For 200 years the secret of Devil's End village has lain dormant, as the burial mound, the so-called Devil's Hump, has remained sealed. Until now, at midnight on April 30th on the greatest occult festival of the year, as Professor Horner prepares to break it open. But just what evil treasures lie buried there? Will the local white witch's warnings of doom and destruction be fulfilled? Who or what is the mighty Azal? But even more disturbing for the Doctor and Jo, just how is the Reverend Magister, alias the infamous Master, involved in the mystery? Originally transmitted in colour 22 May - 19 June 1971, this five part adventure starring Jon Pertwee was lost in its original form. Only a black and white version and an edited colour American NTSC standard version remained until now when technology worthy of the Doctor himself has reconciled the two, synchronising them into one full colour version. The final touch then had to be added, to reconstruct those sequences which had been edited out of the American version and of which only black and white footage remained. 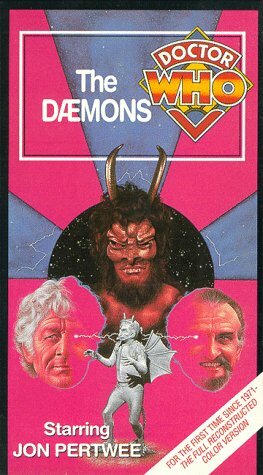 This was achieved by adding colour by hand, with a Paintbox special effects unit, and the end result is The Daemons, in colour in full for the first time in over 20 years. Doctor Who travels to Devil's End Village to probe the centuries-old secret of the Devil's Hump, a mysterious burial mound. Professor Horner plans to break open the mound on the night of the year's greatest occult festival. But a local witch warns of impending doom and destruction. Exactly what evil treasures lie buried there? Who, or what, is the mighty Azal? And most disturbing for the Doctor and Jo, how is the Reverend Magister, alias the infamous Master, involved in the mystery? This five-part adventure, never before available in its entirety, has been brilliantly reconstructed and restored to color for the first time in more than 20 years!